I have heard about the Upswing Poker Lab for quite some time but never really had a chance to have an in-depth look at it until now. Lot's of people have asked me about it as well. So I have spent the past week or so going through each lesson one by one (yes all 42 of them), along with all of the rest of the material in this poker course, in order to write this comprehensive review. The Upswing Poker Lab is really an unprecedented poker training program on many levels. 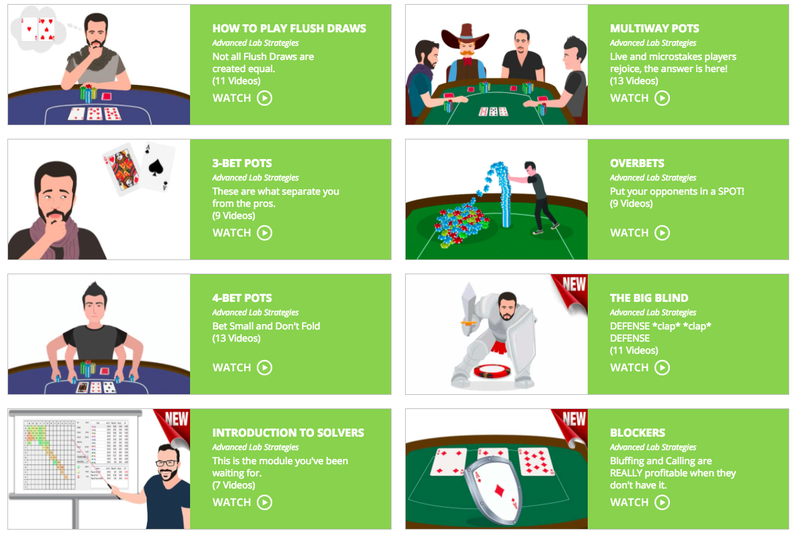 There are literally dozens of high level training modules, hundreds of hand charts telling you exactly what hands to play, and live play videos from some of the best poker players in the world. In this Upswing Poker Lab review I am going to break down all 6 sections of the course for you step by step and give you an inside look into exactly what you will find. 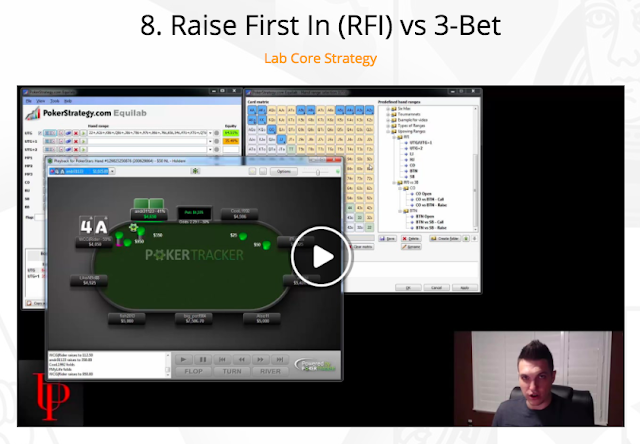 The heart of The Upswing Poker Lab is the core strategy section. This is also the recommended starting point for this course. There are currently 27 modules (lessons) in the Lab Core Strategy section to which more are regularly added. The amount of high level poker strategy instruction included in this section is really impressive. Nearly every subject imaginable is covered to teach you how to dominate live or online poker. 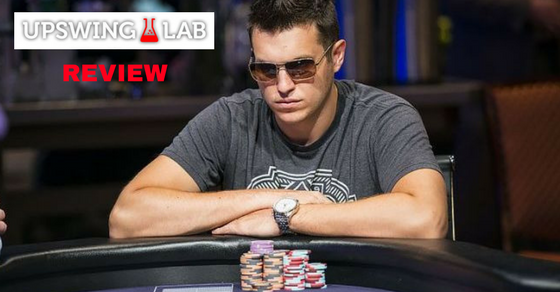 Each lesson is typically comprised of a 20 to 40 minute video by Doug Polk who is a 3-time World Series of Poker bracelet winner with millions more in winnings online at the highest stakes. He explains the core concepts of the lesson making use of range charts, equity analysis tools and hand history examples. He shows you exactly what hands to bet, raise, call or fold with in every situation from the perspective of arguably the best No Limit Hold'em poker player on earth. There is also a writeup below each video lesson (similar to a blog post) explaining the core ideas of the module in even more detail and sometimes with quizzes or other downloadable content. In my opinion it would take you weeks just to get through this section of The Upswing Poker Lab. The amount of high level poker theory covered here is truly amazing and I wish something like this was available when I was first learning the game! I would suggest going through just one or two modules a night in this section of the course in order to prevent yourself from being overwhelmed with too much information. Also, everything is covered here from the basic terminology and the fundamentals of winning poker to highly advanced topics such as river bluff raising ranges. This means that whether your are brand new to the game of poker or a seasoned grinder, you are going to learn a lot along the way here. The core strategy section is still only the beginning of what The Upswing Poker Lab is all about though. Once you have gone through all 27 core modules the next step is the Advanced Lab Strategies section. For somebody who is struggling at NL10 or higher online (2/5 or higher live), this is the section of the Lab that is really going to help improve your results the most. 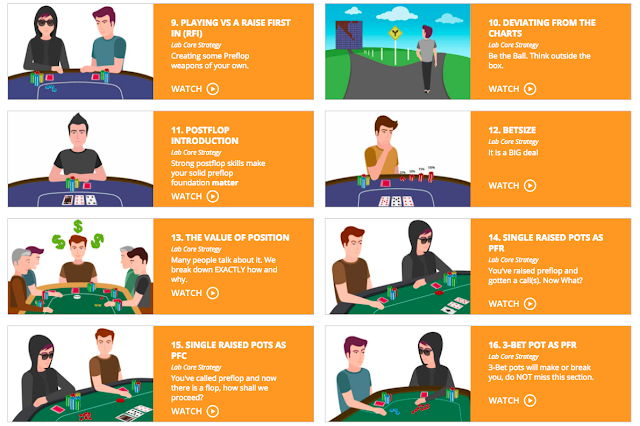 Following a similar format as before, in the advanced section there are 11 more modules with dozens of video lessons on high level poker theory and how to apply it from both Doug Polk and Ryan Fee this time as well, who is also a high stakes poker pro. For me personally, this was one of the best parts of the Upswing Poker Lab because some of the concepts (i.e. overbetting, multi-way pots and deep stacked strategy) just aren't covered elsewhere in this type of detail. And this is the kind of stuff that truly separates the amateurs from the pros. There is also one final module in this section where you can download hundreds of hand range charts (259 to be exact) which explain exactly what hands to play in pretty much any poker situation imaginable. These charts cover online cash games, live poker games and tournaments as well. This is really mind-blowing stuff because you basically get an exact answer for any preflop situation imaginable at the poker table. Raise this hand, fold that hand and so on. 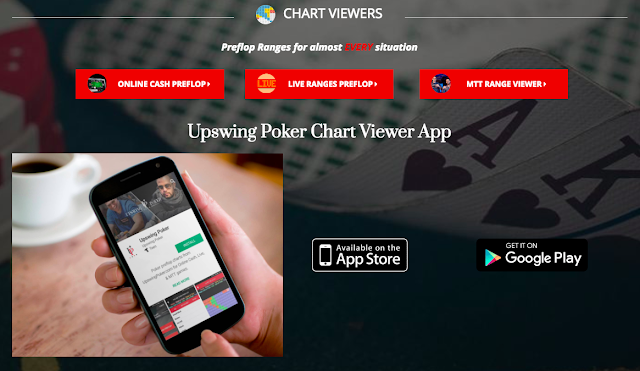 Upswing Poker have also developed their own app for these hand charts (available for both Android and iOS) so that you can view them all right on your phone. Now of course all of the standard caveats apply here. I would advise that you don't try to copy these charts literally. Every situation is different in poker and you need to adjust for things like player type, stack size, relevant history and so on. However, these hand charts are a highly impressive tool nonetheless especially for beginner or novice level poker players who are still trying to figure everything out. They are almost like a "cheat sheet" for how to play. The next section in The Upswing Poker Lab is all about MTT's (multi-table tournaments). Even though I am primarily a cash game player I think this section would be highly useful for any aspiring tournament pros out there. Starting with preflop there are detailed explanations of how ranges work in MTTs and how they differ from cash games. After that there is a large discussion of ICM (Independent Chip Model) analysis and an entire section devoted to just big blind theory (stack-off ranges). All of this is explained with dozens of videos and charts like the other sections of the Upswing Poker Lab that I already discussed above. 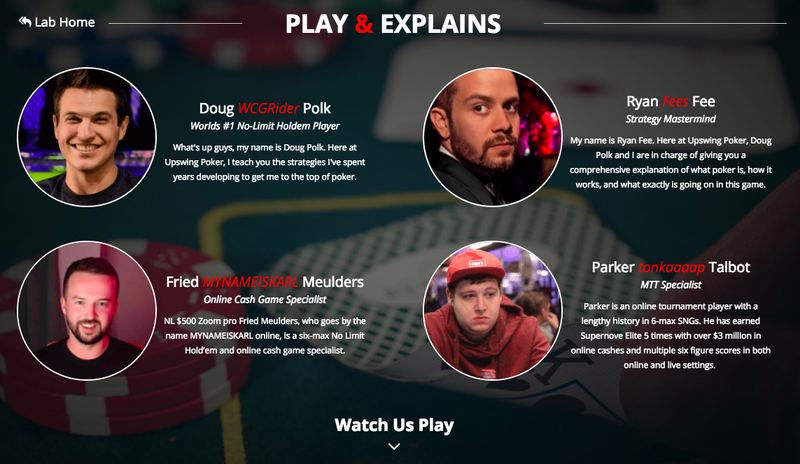 The Tournament section continues with a large "Play and Explain" series of videos which covers actual situations deep in large online tourneys like the WCOOP $100k Final Table. There is also a large section devoted to live poker tournaments, discussing World Series of Poker preparation and strategy in particular. 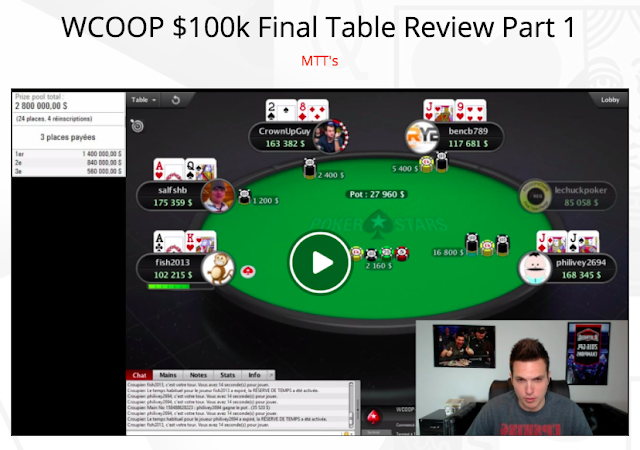 The MTT section finishes with a series of videos on 10bb-25bb short stack play by Parker "tonkaaaap" Talbot who is one of the most successful high stakes online tournament players in the world. The next section in The Upswing Poker Lab continues with a look at live poker. Even though I am primarily an online poker player I found this section to be particularly refreshing as well because so much poker training these days focuses on just internet poker. In this section there are 3 modules and about 20 videos in total. Doug and Ryan discuss various high stakes situations, many of which are televised hands that they themselves played in. There is also tons of expert analysis included on how to adjust your play for live games, how to pick the right casino, reading physical tells and so on. Overall this section is a solid addition to The Poker Lab. There is plenty here to help a live poker newbie confidently step into casino cash games or tournaments and start winning right away. The next section includes a bunch of mini-courses on various advanced topics. This is another section which is tailor made for anyone who has already had some success online or live, but is struggling to really break through to the big time. The mini-courses here include detailed analysis of sample sizes and variance, how to finally fix that redline of yours (non-showdown winnings) and how to master using database software like PokerTracker or Hold'em Manager. The final module in this section was particularly interesting to me. This is a detailed breakdown of GTO (game theory optimal) poker strategy by the man who quite literally wrote the book on it, Matthew Janda (author of Applications of No Limit Hold'em). He explains the main differences between exploitative poker strategy and GTO. The latter becomes an increasingly vital skill to know especially as you start moving up the stakes. Matthew also walks you through the math behind GTO poker theory, balancing your ranges perfectly, and tons of hand history examples to help illustrate it all for you. The last section in The Upswing Poker Lab is called "Play and Explains." And it pretty much is exactly what it sounds like. This is arguably my favorite part of the entire course because it is basically a bunch of old school type training videos like you would see on CardRunners back in the day or like the dozens of videos I made for DragTheBar. Basically you get to look over the shoulder of one of 4 world class poker players while they play and explain their actions. You get to watch as Doug "WCGRider" Polk and Ryan "Fees" Fee play small, mid and high stakes cash games with a little bit of heads up thrown in there sometimes as well. Fried "MyNameIsKarl" Meulders, who is another world class cash game pro, has also been making a lot of 500NL Zoom videos for this section lately. And lastly, the MTT live play videos are once again covered by top tourney pro and popular Twitch streamer Parker "tonkaaaap" Talbot. People ask me all the time what is the best way to improve your poker game these days. If you are brand new to the game or struggling at the lower stakes, then I would say any of the hundreds of articles I have written for this website or my poker strategy books would be the best place to start. But what if you have been playing for awhile though with some decent success? What if you are finally ready to really take your game to a world class level and start making the big money at higher stakes games? For me the answer to this question is now: The Upswing Poker Lab. After having a thorough look now at this massive course, all I can say is that I wish something like this was available when I was just starting out in poker 10+ years ago. It probably would have cut years off of my learning development. Now with all of that said, will this poker course suddenly turn you into a world class high stakes crusher over night though? Probably not. But I believe that The Upswing Poker Lab could definitely be a game-changer for someone currently struggling to produce real, consistent results at the lower stakes right now. I forgot to mention that you also get access to the private Facebook group where you can ask the pros anything you want. And that is truly one of the best parts for me about this course as well. That is, you know that you are learning from the very best. Doug Polk, who created the majority of the content for The Upswing Poker Lab, is a 3-time WSOP bracelet winner and has won millions more online at the very highest stakes. 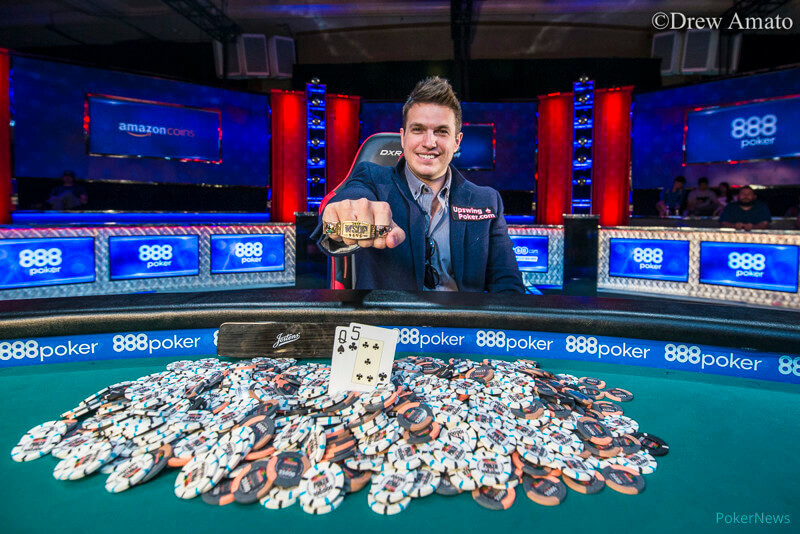 He also won the One Drop High Roller tournament last year for 3.7 million dollars. And the other instructors (Ryan Fee, Fried Meulders and Parker Talbot) are also well known poker pros with lifetime winnings in excess of 7 figures. Membership in The Upswing Poker Lab is just $49 per month and it is even cheaper if you opt for a longer term plan. You can of course cancel at any time as well. This basically means that you get world class poker training for literally the cost of a buyin or two in your current games if you play low stakes. If you are serious about taking your poker game to the next level and finally creating real and consistent profits, then I would recommend enrolling in this poker course. To enroll in The Upswing Poker Lab right now, click here. Let me know your thoughts on the Upswing Poker Lab in the comments below. Like your review! And I think that upswing poker is one of the best (if not the best) Training site. Yes, you are right. There is no perfect poker course or training material out there. 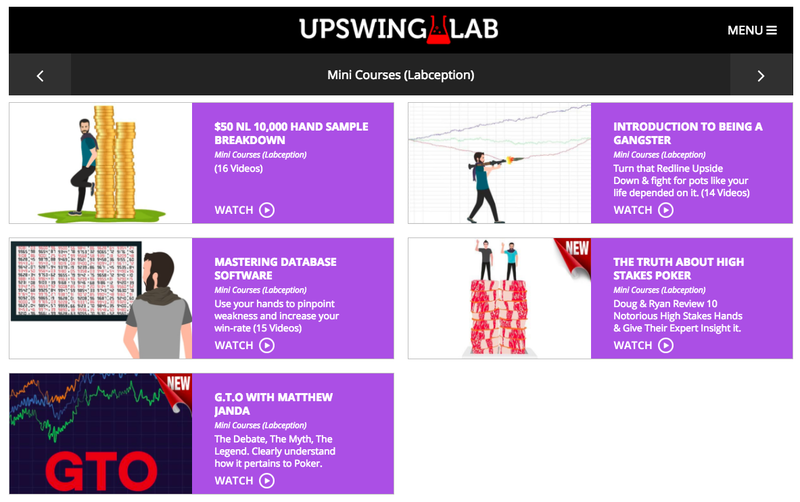 But I also know just how much work goes into creating a course like the Upswing Poker Lab as I am putting together my own comprehensive course for the micros right now. However, after going through the Lab myself, I think it is already one of the best poker training programs out there. The depth of material covered in this poker course from preflop to the river is outstanding. There is also tons of high level theory for more advanced poker players, math based sections for more analytical players, and plenty of excellent advice for live poker players and tournament players as well. 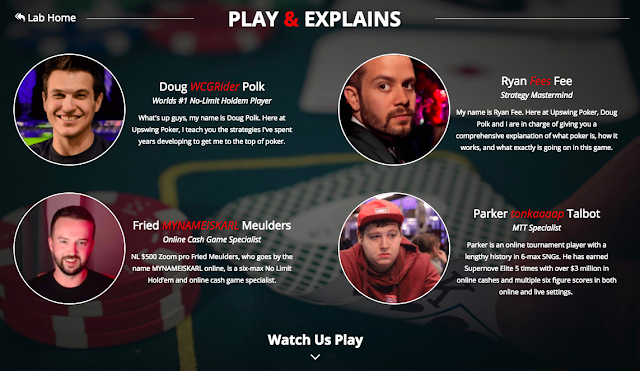 And there are hours and hours of video from some of the best poker players in the world to guide you through it all. They are also always adding new content to keep the course as up to date as possible. Where could this poker course improve? Well, I think more "off the table" stuff such as hand review/poker study and lifestyle/schedule/game selection/fitness/diet (for poker pros and semi-pros) could be included. 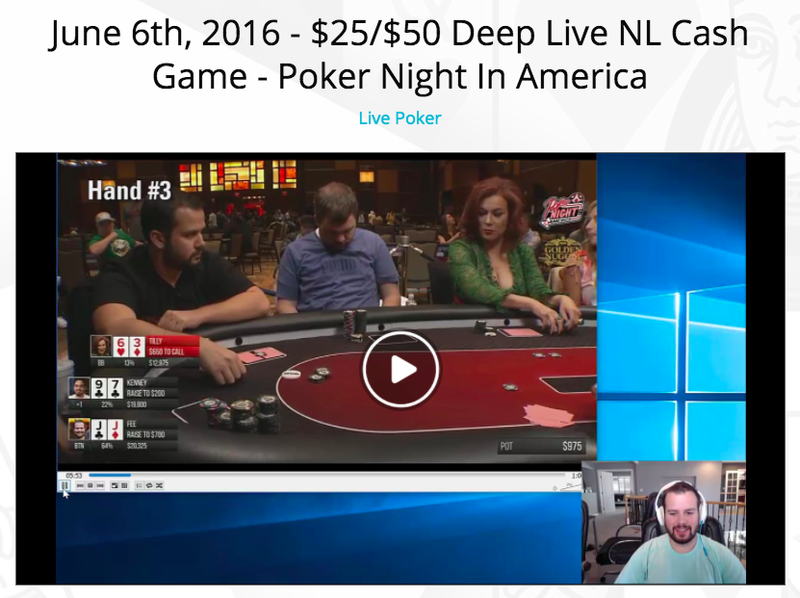 But this is something that I so rarely see covered with any other poker training programs online anyways. The Upswing Poker Lab isn't perfect but I think it is easily the best "bang for your buck" video based poker training program in the world today. Hope this helps.